One of the winners was from my hometown of Cape Cod, MA. The lucky recipients were the Falmouth Public schools. Lynn VanEtta spearheaded the request to help transform their school and creat a "Kinder-Garden Labyrinth of Learning". 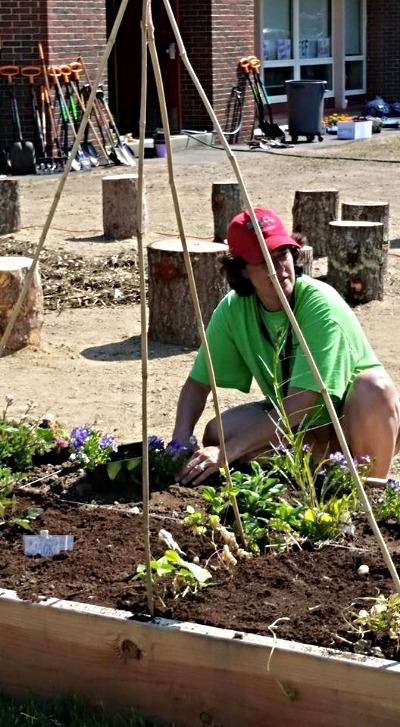 "The Project Orange Thumb funds were used for many parts of our garden project from plants, to wood, to soil, to hoses, to the labyrinth," says Lynn. Look at what the space has turned into......a place where students and faculty can learn and get their hands dirty together!!! That's why I love working with Fiskars. They give back to the communities and help ensure that the next generation will love to get their hands dirty and keep their communities looking beautiful. If you want more information about this Falmouth School project click here and more info about Fiskars click here. Thanks and I look forward to hearing all the success stories from next years winners!!! Posted on September 14, 2015 by Chris Lambton.